An experiment on stage. The evolution of rhythm from chaos to order and back again, as choreographed by The Cosmos. The piece explores the nature of rhythm in science, art and culture. 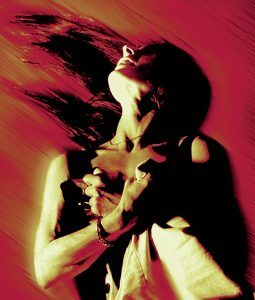 Iron in the Soul is a project which tries to depict the most compelling and awe-inspiring aspects of popular science in a 40 minute dance production, with flamenco at its core. The BigDance 2012 schedule began with a series of exciting experimental dance and rhythm workshops by led by Flamenco Express, leading to a full performance at the climax of BigDance on July 15th. The company includes professional flamenco artists plus a chorus comprising a broad cross-section of dancers from the community. The project offers the participants of all ages and skill-levels a laboratory in how choerographic order emerges from chaos, and a rare opportunity for dancers from a wide range of disciplines to share skills, explore the relationship between rhythms and movement, and to contribute to an innovative performance which examines the boundaries of Science, Myth, and Art. Pythagoras codified music after hearing a smith working on different sized anvils, which produced different sounds directly in proportion to their size. Martinete is probably the most primal form of flamenco. Based on the anvil, and who-knows-what cross-conception of magic and hell which the blazing forge conjured up in the minds of the Gitano, who were expert smiths, of course. Martinete is also the most cosmic of the flamenco forms. A true cry of the lone, travelling individual soul in the vastness of the universe and time. A child of rhythm and vibration – not that old trickster Melody. And as if that were not enough, without its iron core, the earth would have no magnetic field. And with no magnetism, the sun would have stripped away our atmosphere billions of years ago, and we would never have existed. Iron makes our blood red and gives us life in the process. And now we learn that iron is the element on the periodic table which all other elements try to be. It is the most stable organization of atomic particles there is. It is the rhythm of the universe. The anvil of the cosmic forge. And also the forge of music and of flamenco. Again the Gitano knew something without being told. Without having to be taught. No wonder they have always been so persecuted. The theatrical possibilities of this clash of nature and culture are obvious, and so we are seeking collaboration from a range of organisations. Hopefully, a production will see stagelight sometime around the London Olympics. A Performance in Three Parts featuring contemporary dance, musicians and flamenco artists from Flamenco Express. An examination of the relationship between and boundaries of Science, Myth and Art, employing the essential role of the element Iron in the development of life and culture. That the dichotomy between science and art is a cultural artefact and not a useful truth. This is dramatised in the myth of Pythagoras and the anvil, in which the ability to codify music is the natural result of a scientific reality (rhythm/vibration) as expressed in a technological artefact. • Representing everything before the emergence of life. The transition in the early universe from radiation to matter. The emergence of matter from chaos to be represented by emergence of coherent rhythms and polyrhythms from cacophony. Musicians and dancers would be expected to workshop this concept under direction. A range of percussive techniques to be used, including physical sounds. • The desired effect on the audience should be to create a sense of emerging intelligence and life, dwarfed in turn by the Time involved to create it; also to examine ideas of co-operation in the midst of confusion. • The key musical workshop for this section would involve a freerhythm experiment to discover how coherent rhythms emerge in an undirected environment when the members of the workshop are not given any initial time signature or tempo, but are allowed to settle into a natural rhythm. The objective being to ascertain which overall group- rhythm would emerge, and how. From a narrative standpoint, the ideal outcome would be for the resulting rhythm to be that of the human heartbeat, forming a neat link to the human phase of Time. • Representing Humanity and the birth of Art and Science in a single sound. The first strike of the anvil dramatically introduces this section, which uses flamenco because of its unique exploitation of the Anvil (of Pythagoras) in one of the earliest forms of the genre, and because of the role of the gypsies as ironsmiths. Martinete uses only the anvil strike and the voice of the singer. The dancer in this case embodies the human contributions of Art and Science to existence. • The desired effect on the audience should be to create a dual sense of the dilemma of the individual, which is the natural territory of flamenco – plus the collective reality of Humanity as the only organism we are aware of which engages in both scientific and artistic discovery. • Rehearsals and preparation for the flamenco section are not overly effected by the context of the piece, but will be integrated into it by the overall direction of Flamenco Express and Athina Valha. Dancers to act as chorus to the solo, the movement pattern to accompany the martinete compas. • When organic Life ends, as it will, the universe is destined to undergo similarly radical changes to the ones which created life in the first place. The universe itself will die. There are many choreographic possibilities for such a narrative, which would require a disciplined workshop structure within a set timescale. • Representing everything after the end of Life. The transition in the late universe from matter to radiation to ‘Heat Death’. The descent of matter into chaos to be represented by descent of coherent rhythm and melody into cacophony, discord and then silence. The primary desired effect on the audience should be to create a sense of increasing, inevitable discord via polyrhythms. • Musicians and dancers would be expected to workshop this concept under direction. A range of percussive and choreographic techniques to be used, plus sounds from found objects and mass produced sources such as mobile phones, alarms, chimes etc. • Orchestrated text-mobbing of audience mobile phones to convey contemporary information panic and the dictatorship of technology. • The physical exhaustion of the dancers to embody the state of the cosmos in decline. Transition to solitary, individualised, atomised state. Structured collapse of technique. Transition from light to dark, sound to silence, and movement to stillness. Stage anvil. Wide range of formal and informal percussive instruments. • Familiarisation with new rhythmic concepts and genres, including structured improvisation. • Familiarisation of dance students with one of the primary contemporary dance influences – flamenco. • Exploration of science as a source of creative material. • Familiarisation with workshop methods of production. • Opportunities to work with flamenco artists. • Creative input for set passages. The insertion of a large dose of the spectacular into a modern dance performance. Marketing emphasis placed on the grand scientific scale of the ideas involved. The birth of the universe. The first spark of life. And the ultimate darkness of Entropy, when the universe and all matter dies. The ultimate disaster movie on stage. Suitable for all ages, especially teenagers. Because of the scientific and technological themes, the range of possible alternative venues is wide, the obvious ideal being a forge, steelworks or bell foundry. The object being to place art in a different context and thereby challenge established preconceptions. The project is also capable of being productively adapted for schools use. According to myth, Pythagoras codified music after hearing a smith working on different sized anvils, which produced different sounds directly in proportion to their size. Martinete is probably the most primal form of flamenco, and is based on the anvil and the blazing forge which held such significance for the Gitano. Without iron hooves and cartwheel rims, the gypsies would have found their long journey from India even more difficult. `Their skill at metallurgy was central to Gypsy culture and they had no artistic difficulties celebrating the technology of the anvil by playing it. Without its Iron core, the earth would have no magnetic field. And with no magnetism, the sun would have stripped away our atmosphere billions of years ago, and we would never have existed. Iron makes our blood red and gives us life in the process. And now we learn that iron is the element which all other elements try to be. It seems that Iron is the most stable organization of atomic particles. It is vibrating at the desired frequency of the rhythm of the universe. The use of iron as a motif in this piece is therefore unavoidable providing, as it does in this model, the technology of music. 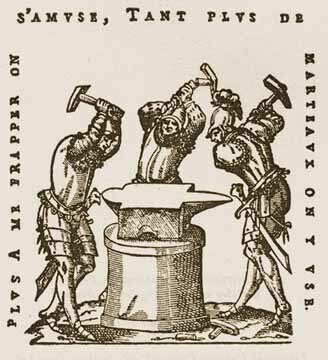 The use of the anvil as a musical instrument also fuses the two conventionally hostile disciplines, and refers to a period when they were not polarized into the specializations which have help grant control of art and science to those who control the specialists. According to the most generally known modern cosmological model, the Big Bang created the universe, and (unless further discoveries are made) the universe according to the Laws of Thermodynamics will eventually peter out into the dark matter-less oblivion of Entropic absolute zero. This is now almost popular culture. This project does not assume the scientific truth of that model, but gratefully accepts it as an artistic reality and a formula which symmetrically sandwiches the Human Race between two vast periods of chaos and change.